This item will undoubtedly be of interest to a number of small business owners who have been impacted by hurricane Sandy. 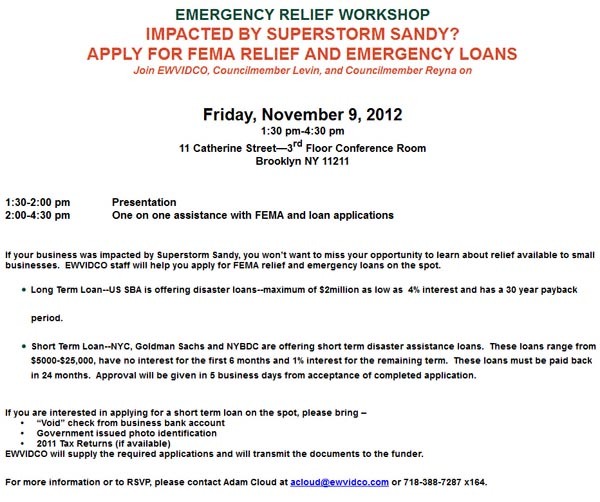 This upcoming Friday, November 9th, starting at 1:30 p.m. the folks at EWVIDCO, along with Councilmembers Diana Reyna and Steve Levin will be conducting an Emergency Relief Workshop. The above missive outline rather explicitly what attendees need to provide. This is a great opportunity for anyone who needs help negotiating the copious paperwork required to receive assistance and get his/her businesses back up and running. What’s more, it is totally free! Check it out! Friday, November 9, 2012 starting at 1:30 p.m.